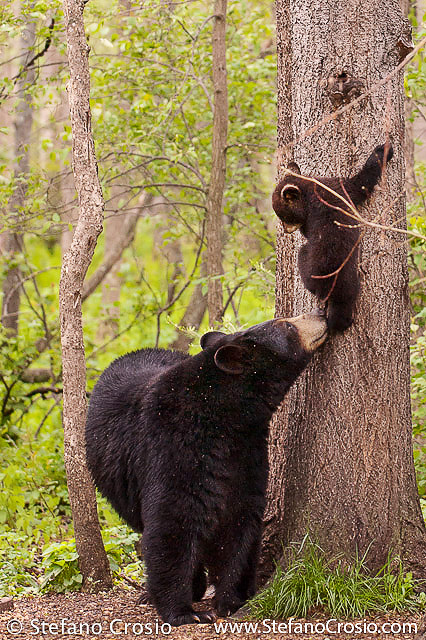 Black bears (Ursus americanus) are proficient climbers. They use their curved claws to cling to the bark and quickly climb high into trees. Generally, they do it to escape danger (it is common behavior for cubs), to eat the nuts or fruit in the tree, or to rest or sleep at the juncture between branches and trunk. In this image, a young black bear is descending a tree after an excursion to the canopy. It is amazing to see how even little bears will climb quickly and with dexterity all the way to the top branches of tall trees and perch there for a nap, with no fear of heights. By contrast, grizzlies have longer claws that are not as well suited for climbing, which makes them not as effective a tree climber as black bears. This does not mean, however, that grizzly bears cannot or will not climb a tree. They certainly can, they are only clumsier than black bears (given also their heavier structure) so to climb a tree they often resort to hugging the tree and pulling themselves up, using branches as if they were the steps of a ladder. Anyway, should you experience a close encounter with a bear in the wild, follow sensible bear safety procedures and avoid climbing a tree because chances are that either species of bears will climb it at the very least as well as you can! 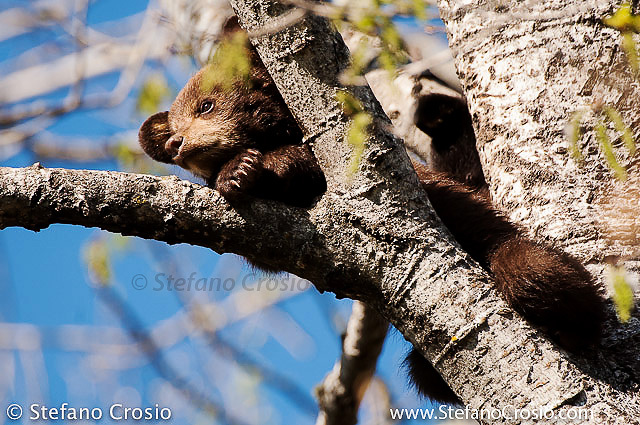 This entry was posted in Photography, Wildlife Photography and tagged bear, behavior, black, climb, cub, nature, photography, tree, wild, wildlife on March 26, 2013 by Stefano.